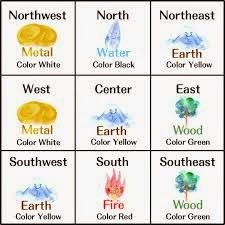 These elements also have objects, shapes, seasons, body organs, chakras and colors connected to them, but the color component is often the most powerful. Listed below are the main rooms of the home and the best wall color choices for them according to Feng — Shui principles. Keep in mind there are other schools of Feng — Shui which may differ. This list comes out of the Western Form School philosophy which is followed the most. Blue and Black: It is associated with water energy, support inner work, helping us to concentrate, contemplate, mediate and handle creative endeavors. Blue can slow the heart and breathing rates and lower blood pressure. It can be used to increase coolness, to calm and to create privacy. Green: It is associated with wood energy, the energy of growth, decisiveness and action. It can motivate internal change. Red: It is associated with fire, which supports life energy. The color of blood, it can increase heart rate, respiration and blood pressure. It also can promote activity and alleviate depression. It's clearly the color of passion and love. Yellow: It is associated with earth energy, representing Mother Earth. It can cheer, infuse with hope, clarify and elevate mental activity. It also creates a sense of stability and nurturing. Yellow is often used to help children with dyslexia improve their focus. White and Metallic: They are associated with metal energy. They can support carefulness and focus as well as purity. Bedrooms should be calm spaces to promote rest and rejuvenation. The earth element is best in bedrooms to support being grounded. Too bright colors are too active for bedrooms and too dark colors are too depressing. We want the right amount of restfulness but not to the point that it is depressing. For children‘s bedrooms, make sure to NOT paint them purple or pink. Use a more restful sage green and accessorize with the purples and pinks only. These are far too fiery for bedroom wall colors and most likely you will find you child will love the room during the day but won't want to sleep there at night. See my article on Yin and Yang for a balanced home and Feng - Shui for Children's and Teen‘s Rooms. Don’t recommend: Bright colors. fiery colors such as bright reds, purples, pinks or oranges. ~ Dark colors such as black, brown, grays, navy blue or dark green are also not recommended. Bathrooms already have a lot of the water element represented by mirrors along with water from the pipes. More blues adds more water, creating an even greater in-balance. Earth, however, balances the water element in the five elements cycle and brings this very watery room back into elemental balance. Best Colors: tones, pastels, whites. Don't Recommend: Blues, dark ‘watery‘colors such as black, grey, navy, dark brown or green. Best Colors: Earth tones as well as brighter colors. Don't Recommend: Reds, black, navy blue, grey, dark brown, dark green. Dining rooms should be calm, Peaceful, spaces. Earth tones promote groundedness, which is what we need for good digestion. Use any color that is more muted that you love, but make sure it is not a color from the water element such as black, grey, navy blue, dark green or dark brown. The same principles apply here as in bedrooms. Best Colors: Earth tones, sage greens, pastels, more muted colors. Don’t Recommend: Reds, unless you want to eat a lot more red stimulates everything, including appetite. Black, gray, navy blue, dark green or dark brown are also too watery. Home offices should be more active so that you can get things done. You can use the holder colors here. This is not the room to be so cozy that all you want to do is curl up and read a book. Don't Recommend: Darker tones or any color that reflects the water element which is too floaty and ungrounded.